Broadstairs Cricket Club 1st XI team continued their winning ways with a comfortable win at home to Gore Court, chasing down a modest target of 154 with 17 overs to spare. Losing the toss and invited to field, the opening bowling partnership of Farjad Yasir and Elliot Fox restricted Gore Court’s scoring to 39 in the first 10 overs, although no wickets fell during this opening period. This pattern continued as the bowling partnership switched to Masoud Rangin and Swaroop Dasari with Dasari (1-19 off 10 overs) presenting a persistent threat. The Gore Court batsmen eventually succumbed to the pressure when Paul Edwards, who had survived an earlier enthusiastic run out appeal, was successfully run out by Matthew Frewin for 20, bringing to the crease the overseas batsman Bowers. He was quickly into his stride and began to push the scoring rate along with a succession of ramp shots and confident hitting. His partner Campbell was dismissed in the 20th over, stumped by Chris Flint off the bowling of Dasari and Bowers was then joined at the crease by Kanotra. 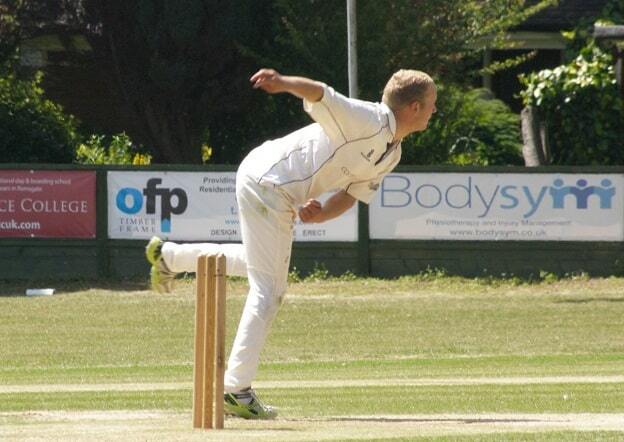 Frewin adding an acrobatic catch to his wickets and run-out to round off another impressive performance from him. Gore Court finished on 153-9, a below-par score for a batting-friendly pitch and testament to the strength in depth of the Broadstairs bowling coupled with some excellent fielding. Whilst the hosts eventually achieved the target with wickets and overs to spare, the secondd innings did not proceed as smoothly as it might have done. 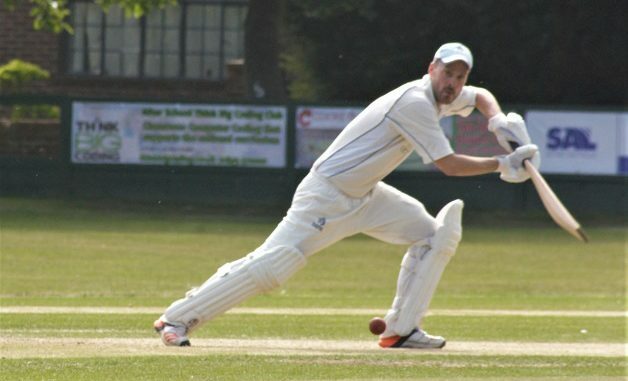 The scratch opening partnership of Fox and Andy Marshall, who had been drafted-in at short notice for the injured Luke Palmer, lasted just a couple of overs with Marshall trapped LBW by Boynes for 1. Fox was then joined by Flint and they set about their task in a measured manner, having to see off some high quality bowling from Boynes and Asilzada. 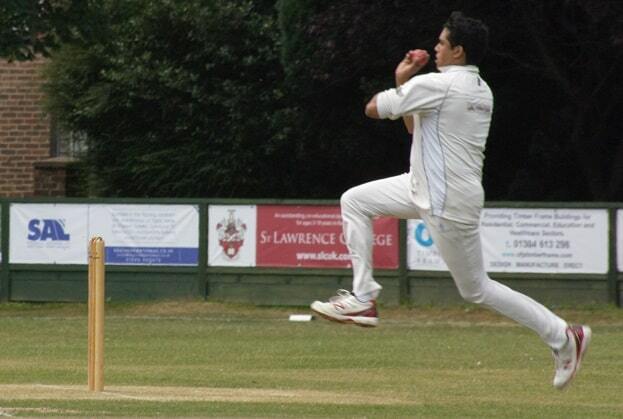 By the end of the 7th over, only 8 runs had been added to the total although Azilzada’s 4th over yielded 13 runs and the Broadstairs reply was up and running. The partnership between Fox and Flint continued to flourish for the subsequent 10 overs and they had advanced the score to 79 when Flint (32) was caught at mid-off, ending what had been his best innings of the season. Dasari was in next and raced to 13 in just 8 balls before lobbing one to cover for a simple catch and his place at the crease was taken over by Jack Wheeler whose rapid-fire scoring accelerated the total to 127 before he too succumbed, LBW to Asilzada. This wicket was quickly followed by the loss of Callum Morgan (0) and Dewell (7) although throughout, Fox (55*) remained calm and assured and he was able to steer the side home, achieving his 7th half-century in 8 matches in the process. The win is a significant boost to Broadstairs promotion chances, extends the gap between them and 3rd place Hayes to 47 points. 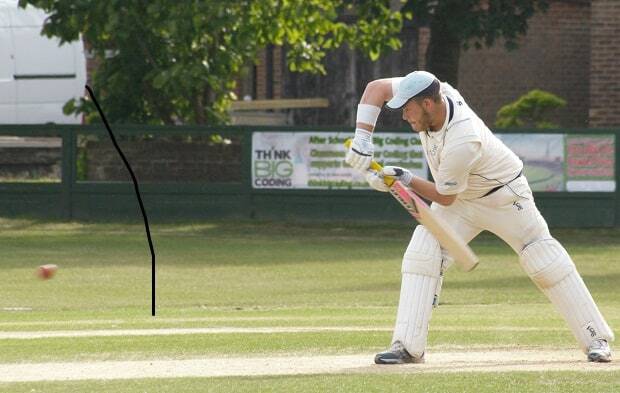 The next match represents the half-way point in the season and takes Broadstairs to Upchurch in what promises to be an intriguing top-of-the-table clash. 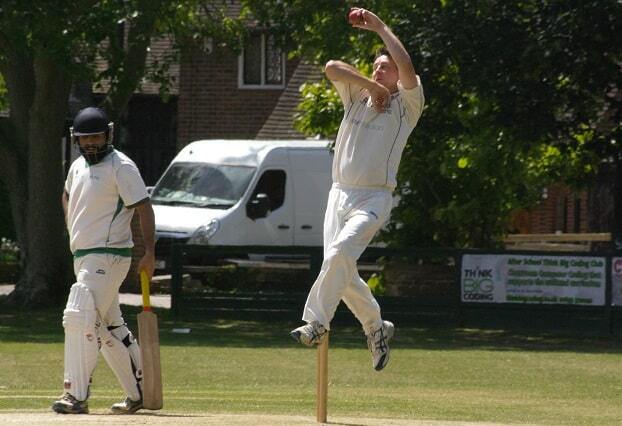 Broadstairs got back to winning ways last weekend with a convincing victory over Gore Court. Winning the toss, stand in skipper James Bond elected to bat. Father and son Hewitt opened the batting, Lewis (0) dragging on in the first over. Simmo joined Lee and they both feasted on an array of boundaries until Lee (13) was caught. Scott joined Simmo and he too tucked in, 4,4,6,4 his first four scoring shots. Simmo (20) was caught and bowled for the second time in as many weeks and Nathan Fox helped Scott keep the scoreboard ticking over. A stand of 71 in 17 overs put the pressure back on Gore Court, Scott punishing anything full and bringing up his half century and with Natty pinching ones and twos the oppositions heads were dropping. Nathan (26) eventually fell in the same fashion as Simmo but he had helped put us in a great position. 129-4 with 20 to go. James joined Scott who then brought up his hundred, a fantastic chanceless innings but he wasn’t done just yet. The last 3 overs saw both batsmen punishing everything, James (18*) has found a new scoring area, clearing that front leg out of the way and sending the ball into the mid-wicket boundary and Scott brought out the reverse slaps (he liked to call them sweeps, they were far from it!) and 47 runs came from the final 14 deliveries! 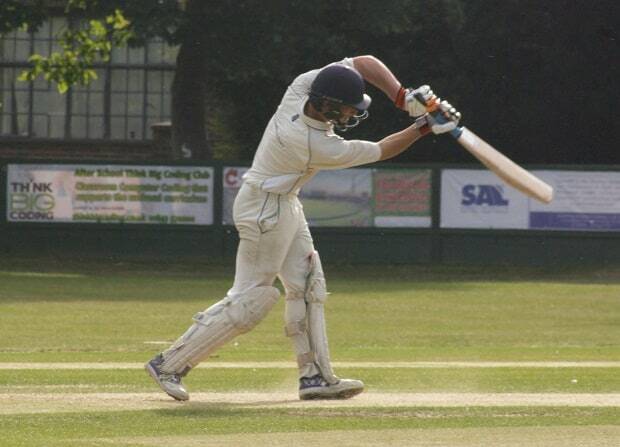 Scott finished unbeaten on a fantastic 128* and helped us set a total of 249. Bradley Ellison and Callum McCormick opened the bowling but it seemed like the bad luck from the previous week had followed into this week, drop catches, beating the bat time and time again but no wickets, until Lewis took a catch off Cal in the 18th over. At 38-1 Gore Court still had plenty to do. Brad finished his spell (10-5-10-0) and was replaced by Josh, Cal finishing (10-2-26-1) and Ashley took over. The change brought wickets, the Walrus getting the number three in his second over and removing the other opening bat in his third. The number 4 looked handy, fizzing some impressive drives through cover but he had no help at the other end. 68-3 at the half way stage, surely it was just a matter of time. Oli replaced Ash after 5 overs, Josh continued twirling away and got some reward in his 9th over, the dangerous number 4 well caught by Oli on the boundary. He got his second in his last over and a tidy spell cam to an end (10-1-43-2). 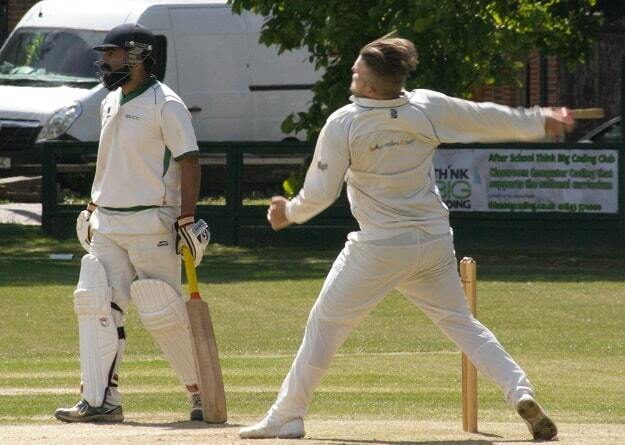 At 116-6 in the 38th and Gore Court was just looking at batting points, Tray was back into the attack in tandem with Oli. This season’s top wicket takers should exactly why they have so many between them and cleaning up the tail, 2 more for Tray (8-0-30-4), Oli also picking up 2 including the final wicket caught & bowled (7.2-0-24-2). The win moves us up to joint third in the table, 2 points behind Bickley Park. Scott Narraway taking this weeks MoM for his superb century. Next match we welcome Old Colfeians to Park Avenue, we never really know what team they will turn up with but they have one of the leagues best bowlers and some handy batsmen, it promises to be a great game so all support will be much appreciated. ‘Ingredients’ for Ramsgate cafe owner’s wedding include Druid, smuggled Mead and cauldron!